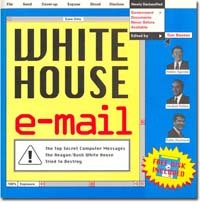 White House e-mail in "true emergency conditions"
"Federal court hits Bush White House over e-mail"
"Court Orders Search of White House Computers"
"Missing White House E-Mails Traced, Justice Aide Says"
"The Ongoing Saga Of Missing E-mails"
"Court orders White House to preserve e-mails"
"Judge hits White House with preservation order"
"White House office ordered to search for e-mail messages"
Washington, D.C., January 15, 2009 - The federal magistrate judge overseeing the White House e-mail litigation today said the issue had reached "true emergency conditions" with only "two business days before the new President takes office" and that "the importance of preserving the e-mails cannot be exaggerated," according to the court's Memorandum Opinion issued this morning along with an Order and posted on the National Security Archive website, www.nsarchive.org. Magistrate Judge John Facciola formally ordered the White House to search all Executive Office of the President components' workstations and portable media for possibly missing e-mail -- enforcing yesterday's order from U.S. District Judge Henry Kennedy -- after government lawyers at a hearing yesterday represented that they would only search those EOP components that create federal agency records and leave out offices that create presidential records. 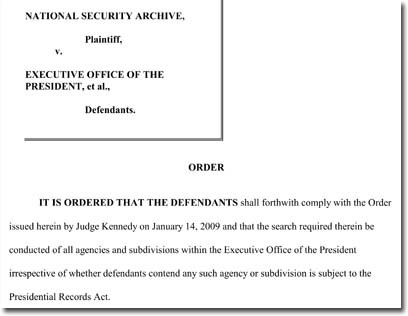 Today's order also granted plaintiffs' requests that a full inventory of all backup tapes and portable media containing White House e-mail be delivered to the Archivist of the United States and filed with the court, and that the full administrative record and all other evidence related to the White House e-mail be preserved under the custody of the Archivist. "From the outset, the White House has fought tooth and nail against having to preserve sources of missing e-mail as well as other evidence relating to this case," said Sheila Shadmand of Jones Day, counsel for the Archive. "For the umpteenth time, this Court has commanded that they do so. We expect they will yet again object to the terms of these Orders, when instead they should be busy complying with it. The clock is running out." The hearing yesterday before Magistrate Judge Facciola included representations from Justice Department attorney Helen Hong that the White House had spent $10 million on an e-mail restoration project that had located some 14 million e-mail that had not been counted in a 2005 analysis by White House staff. However, White House Chief Information Officer Theresa Payton told the staff of the House Oversight and Government Reform Committee on February 22 last year that her efforts had uncovered some 23 million e-mail that had not been found in the 2005 analysis. The government has provided no explanation for this discrepancy, or for the contradiction between White House statements that "I wouldn't rule out that there were a potential 5 million emails lost" (Dana Perino, April 13, 2007) and "no reason to believe that any e-mails are missing" (Tony Fratto, January 18, 2008). "From the beginning, the White House has changed its story from 'emails are missing' to '23 million emails were found' and back to 'no emails are missing.' The truth is, neither we nor the public knows what was going on, nor can we verify the White House's efforts because they continue to conduct themselves under a veil of secrecy," noted Archive General Counsel Meredith Fuchs. White House components that are governed by the Federal Records Act include the Office of the Trade Representative, the Office of Management and Budget, the Office of Science and Technology Policy, the Council on Environmental Quality, and the Office of National Drug Control Policy. White House components governed by the Presidential Records Act include the National Security Council, the Council of Economic Advisers, and the President's Foreign Intelligence Advisory Board. A chronology of the litigation is available here.